The Five Behaviors of a Cohesive Team Profile is designed for intact teams working together to reach the same organizational goals. Based on Patrick Lencioni's New York Times best-selling book, The Five Dysfunctions of a Team, this Everything DiSC-Based Profile provides your team with personalized, constructive narrative you can use to improve your culture and increase productivity. It is a research-validated online profile that provides participants with a personalized report. 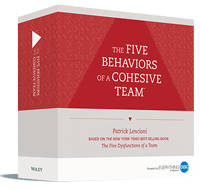 Please note: The Five Behaviors of a Cohesive Team is designed for intact teams. Each team member will need their own assessment. 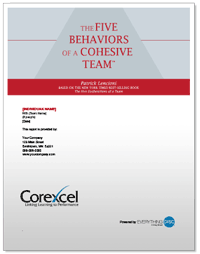 The Five Behaviors of a Cohesive Team Facilitation Materials include everything you need to conduct an effective, personalized Five Behaviors of a Cohesive Team program with little or no experience in DiSC. The Five Behaviors Model is broken down into 7 modules, ranging from 1 ½-3 hours in length. Conduct the training program as-is or customize it by spending more or less time on each of the five behaviors. The Five Behaviors of a Cohesive Team Take-Away Cards are excellent job aids to keep concepts fresh with your team members. Each pack contains 20 cards each for Trust, Conflict, Commitment, Accountability and Results.